We know your cats health is very important to you and your family. We provided a variety of topics about kittens and cats health for you to read. By selecting a kitten as your pet, you have chosen an extremely clean pet that usually needs little house training. Your kitten is likely to require little care but provide excellent companionship. He will, however, demand that his love and loyalty be earned. Cats must have regular meals, clean litter, grooming, and attention in the form of play. Your pet will be quite content to live his entire life indoors provided that you offer companionship. Male or female, kittens and cats are affectionate, intelligent, and playful. However, unless you plan to breed your cat, neutering is recommended to keep males from spraying, and females from producing unwanted litters. Sterilization will also prevent a multitude of medical problems. Sterilization should be performed at 4-7 months of age. Needed supplies for a new kitten include high quality food, bowl for water and food, a litter pan with litter and scoop, grooming tools, a pet carrier, and of course, toys. Read more about a kitten’s new home. Read more about a kitten’s behavior. Read more about kitten nutrition. Feed a diet that is 100% complete and balanced for your pet’s particular life stage: pediatric, adulthood, and senior cat. Provide plenty of fresh drinking water for your cat at all times. Don’t substitute milk for water, or milk for a meal of solid food. Do not feed your pet table scraps. Don’t feed your cat raw fish. Don’t feed your cat any food that may contain small sharp bones (such as chicken bones). These bones may splinter and cause choking or digestive problems. Don’t feed your pet raw meats because of the possibility of parasitic or bacterial infections. Don’t feed your cat raw eggs. 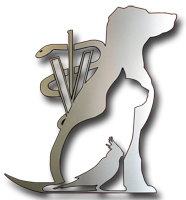 We carry a variety of high quality vitamin supplements to help insure a long healthy life for your pet. Read more about nutrition for cats. Daily brushing of your pet to remove loose hair is the best prevention. Long-haired breeds especially need special attention. After brushing, wipe your cat’s hair coat with a damp towel to remove loose hair. Medications are available to eliminate hairballs and help prevent recurrence. Laxatives in the form of pastes have been recommended for many years. There are many different brands available that will be readily accepted by your cat. If your cat does not accept it, the gel can be rubbed on his mouth, nose, or even on the feet. It will then be swallowed during his normal grooming process. If this does not help a bulk forming laxative (Vetasyl®) sometimes works well. Read more about cat hairballs. What Is Ringworm? A microscopic fungal organism causes ringworm. How Is Ringworm Spread? Ringworm is spread by direct contact with an infected animal (or person), or with infected bedding and grooming tools. Can Ringworm Be Spread To Other Species Of Animals? Yes. The fungal organisms that cause ringworm are very contagious and can be spread from pet to pet, pet to human, or human to pet. What Are The Signs Of Ringworm? Early signs include dry, flaky skin, broken hair, and bald patches on ears, front legs and around the eyes. More advanced signs include crusty lesions and infected areas that become red and sore. If My Pet Does Not Show Signs Of Ringworm, Does That Mean It’s Not Infected? No. Many cats do not show clinical signs of ringworm but are CARRIERS. Why Is This Disease Called “Ringworm”? Healing of the infected areas occurs from the center out, creating a ring effect, thus the name “ringworm”. Which Cats Are Most Susceptible To Ringworm? Ringworm is most common in young cats, and in cats with debilitating diseases. What Should I Do To Be Sure My Cat Is Not Infected? All new cats and kittens you adopt should have a fungal culture performed to determine if it is a “carrier”. Cats get heartworms too! All cats should be protected from heartworm disease. But, how do cats get Heartworm Disease? Cats get heartworm disease in the same way that dogs do. Mosquitos transmit the disease by biting an already infected animal, and then pass the infection on to other animals they bite. suffer in silence with no signs of this serious illness. Aggressive treatment of the infection has a high chance of serious complications, including death. There is no good solution once the car is infected with heartworms. Without treatment, the risks of lung damage is high and death is not uncommon. We treat infected cats with long-term preventatives to decrease the number of worms and minimize symptoms. The only good solution to this dangerous disease is to prevent it. We have preventatives that are very effective and easy to use. No cat should have to suffer with this easily preventable disease. The caretaker does not keep the litter box as clean as the cat wants it to be. The owner buys a new box and throws out the old one. The owner cleans the litter box with too harsh a cleaning product. The home is too large for just one litter box. The good news is cats seldom develop cavities, as do humans. The most common dental problem that we find in cats is Periodontal Disease. This disease affects the gums and other tissues around the teeth, instead of the teeth themselves. About 75% of all dental problems serious enough to be seen by a veterinarian, are the result of periodontal disease. It is the cause of 95% of all cases of “bad breath”, and affects 80- 85% of cats over the age of 3. In advanced cases, it results in infected, foul-smelling, loosened teeth; with a massive, unsightly accumulation of tartar. Often there is a loss of appetite due to painful gums. Even signs such as diarrhea, vomiting and irritability may be the result of this disease. Food material, bacteria, and saliva accumulate and adhere to the tooth surface, forming a soft “plaque”. This material can be easily removed with routine brushing. However, if buildup is allowed to continue, this plaque becomes hard and chalk-like tartar. Tartar buildup causes erosion of the gums, with subsequent inflammation and infection of the tooth socket. The teeth then become loose, and may even fall out. The gums become reddened, swollen, and bleed easily. The animal often salivates excessively from the associated pain. The buildup of this material allows bacteria to constantly grow in the infected mouth tissue. These bacteria may enter the bloodstream through the bleeding gums; and cause such problems as: heart valve infections (endocarditis) and kidney infections (nephritis). Periodontal disease is often very painful for the animal, as well as causing it to be unpleasant due to the bad mouth odor. Read more about dental hygiene for cats. Wellness exams are vital to a senior cats health. We put together general recommendations for you to review and print.